A Maiden Stakes over 7f on Standard going. Fourteen runners taking part all three-year-olds bar two both aged four. We have been mulling things over these last few days with nothing too much to catch the eye. However, we have something worthy of inspection today. I mentioned Basheer when he made his debut almost a month back. 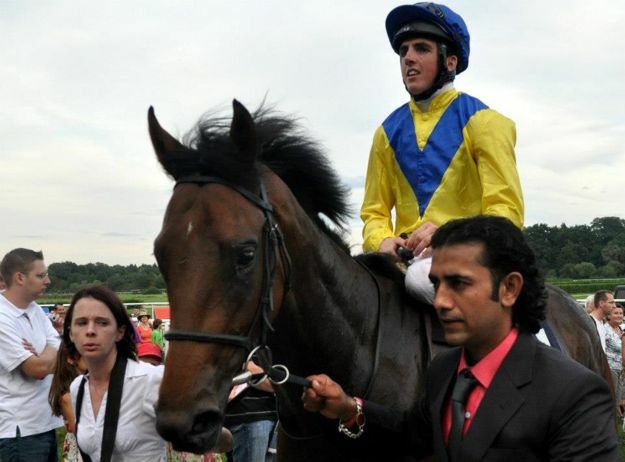 Trained by Marco Botti, this son of Dubawi has been noted as one of this Newmarket trainer's better juveniles. In fact, we gave this and another horse as tips detailed in this post. Karl Burke's Fear The Fury ran out a tidy winner. However, Basheer, although heavily backed, really didn't start his career well at all. This chestnut colt had a wide draw to contend but a slow start gave punter's little hope when very sleepy from the stalls. After that desperate beginning, he pulled much too hard to a point where his jockey let him do his own thing, almost vying for the lead, before falling into a hole out of pure exhaustion. It didn't make good viewing. I was very thankful we went for two single bets rather than Botti's charge as a dynamic each-way poke. Basheer finished second from last, beaten sixteen lengths. Debutantes can make difficult bets and this character certainly gave testimony to that fact. I often say the worse a horse looks on debut - the better it is. Some of the best horses in training have transformed from Eeyore to Pegasus. I'm not sure what is the middle ground between these two extreme but hopefully, it is Basheer. This homebred comes from a talented sire. The mare, Reem, started her career in Australia, running once at two where she finished second, winning over a mile at three, and competing at pattern class. From there she raced predominantly at Meydan for Mike De Kock winning at Listed class, placed in Group 2. In 2011, she visited the UK racing three times in Listed class but proved a disappointment. At her best, Reem achieved an official rating of 107 and total earnings of over £220,000. She was similarly owned to Basheer. Luke Morris takes the ride on Basheer. Botti has applied a hood this start no doubt trying to keep this March foal focused and calm. A low draw is a positive on this turning track although after a slow start and being thunderously keen on debut it will be interesting to see what tactics are employed. The betting [5/1] suggests connections are far from deflated by that first disappointment. Make no mistake this horse has a level of ability. However, to win any race sheer ability isn't always enough. Those debut antics could well be put down to inexperience. They most probably were. It pays to be careful because temperamental horses are bad news. This would be a major concern. With being off course for almost one month we can be pretty sure Botti has been working hard to get this horse ready. Few horses are fancied in the betting. No surprise to see one of John Gosden's debutantes short in the betting. Tricorn cost 100,000G when purchased at two. This could well be a significant betting guide for this son of Helmet. A wide draw isn't ideal. Swilly Bay is another debutante from Charlie Hills. This a grey son of Mastercraftsman races in the familiar silks of John C Grey & Partner. This Irish-bred cost 100,000E at the yearling sales. He too has a relatively wide draw. Dark Destroyer is fancied in the betting. Joseph Tuite's horse has show ability, placed in two of his four starts, and was originally given an official rating of 80 [now 75]. Conclusion: Interested to see how Basheer goes after a desperate first start. I'm pretty sure Botti rates this three-year-old which is well bred. It is difficult assessing a horse on one, disappointing, effort. On balance, I would give this colt the benefit of the doubt. Debutantes can often look poor and although he was slow and pulled very hard there were signs of ability. I would have a small each-way bet and hope the trainer has resolved those initial problems. If Basheer is a class horse, Tricorn and Swilly Bay will need to be talents on debut. Both have relatively wide draws which isn't ideal on this turning course. If Tricorn is priced 5/2 & less SP it could be worthwhile splitting your take and betting two singles with Tricorn and Basheer.